Proteins contain valuable amino acids which are highly important for the body. As a result, numerous foodstuffs contain vegetable proteins. However, technical products also contain vegetable proteins – such as plastics, cosmetics, paints and textiles. 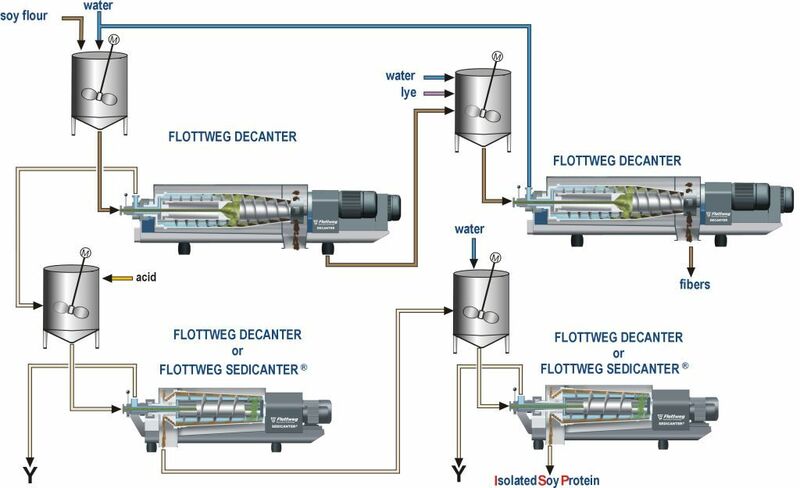 Flottweg decanters and Sedicanter® machines offer the optimum solution for producing soya protein, pea protein, lupin protein and rapeseed protein. Our machines isolate the valuable protein from the plants. At the same time, we offer you the right industrial centrifuge for all process steps – extraction, washing, concentration and clarification. The objective is to produce the maximum amount of protein from the plants, with the best possible quality. Soya beans contain about 40% protein, of the highest quality. Most soya beans are used for obtaining soya oil. This is used as the basis for foodstuffs or biodiesel. Soya protein can be produced as a concentrate and isolate. The pea can be used for producing more than just protein. Starch production also plays a central role. It is important to produce both valuable materials as effectively as possible. Lupins are a valuable source of protein. The protein is of the highest quality, and can be used as animal feed for example. Whereas lupins are still rather unfamiliar in Europe, they already play an important role in America. The rapeseed plants forms pods after flowering, and the pods contain small seeds. Each of these seeds contains up to 40% oil. This can be extracted using industrial centrifuges. The residual rapeseed meal is used as fodder for animals. Impeller: The clarified phase is output via an adjustable impeller. This achieves a flexible balance between maximum total dry solids and purity of the centrate.